Netscape, the mid-1990s maker of Navigator, the first widely popular browser, was critically important to the technology, the culture, and the perceptions of the early Web. 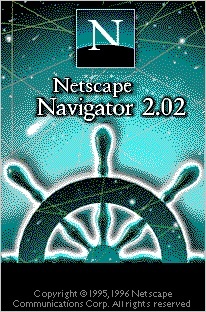 The Navigator browser brought the Internet to untold millions of people, and I’d wager that many of those mid-1990s first-time users still think fondly of Netscape and the funky, outer-space logo that lit up with what looked to be comets or shooting stars when the browser was making a connection. Netscape’s chairman was James H. Clark, a founder of Silicon Graphics who in 1994 was looking for the next big thing. 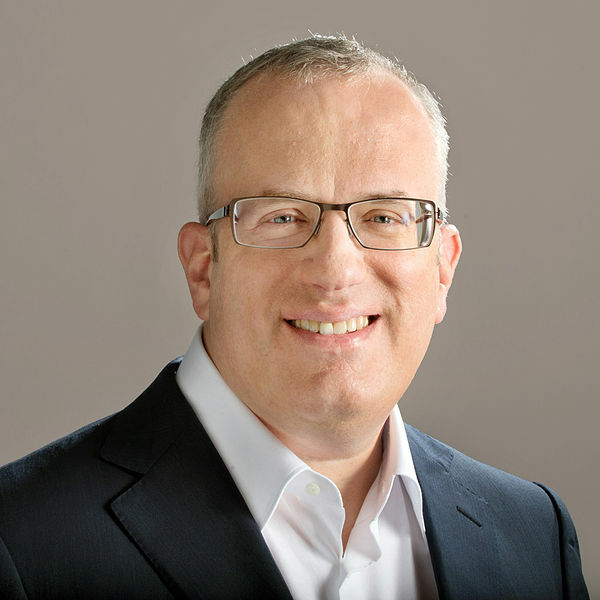 He seeded Netscape with $5 million and, as I note in 1995, “infused the company with a certain ardor.” Clark recruited James Barksdale, a Mississippi native, from McCaw Cellular Communications to be Netscape’s chief executive. Barksdale was modest, gentlemanly, and “as mellow as shoofly pie,” one technology writer said. But Andreessen and Netscape’s stable of young programmers helped define the swagger and flamboyance of the early Web. They relished poking at the lumbering giant that was Microsoft, and projected an aura that almost anything was possible online. Suggesting as much was Netscape’s eye-popping IPO — its initial public offering of shares — on August 9, 1995. At the time, the company was not quite 16-months-old and hadn’t come close to turning a profit. Netscape’s IPO had the effect of suddenly demonstrating that the Web was a place of great potential, where riches were waiting to be made. 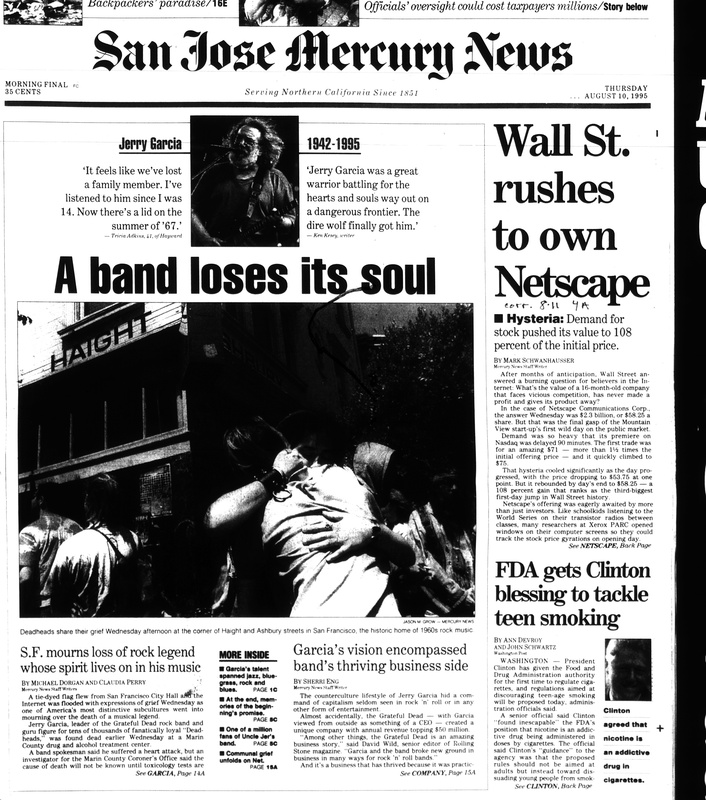 Reports about the IPO made the front page the following day in many newspapers, including the Mercury News (see left). But the Mercury News gave top billing not to Netscape but to news the death of Jerry Garcia, the Grateful Dead’s co-founder and front man. If Netscape’s browser opened the Web to millions of users, the company’s ill-fated struggle with Microsoft seemed to illustrate the risks that upstarts faced in taking on entrenched entities that were powerful, formidable, and very rich. Netscape’s stunning run as the flamboyant startup of Silicon Valley reached an inglorious end in November 1998, when Barksdale announced that America Online was acquiring the company in a stock deal worth more than $4 billion. The once-cocksure Netscape was thus reduced to a forlorn and ultimately forgotten outpost of AOL. This entry was posted on July 21, 2014 by W. Joseph Campbell in 1990s, Anniversaries, Internet, Netscape, Watershed year, World Wide Web and tagged 1995, Browser war, Early Web, Internet, Netscape, Startup, Watershed year.